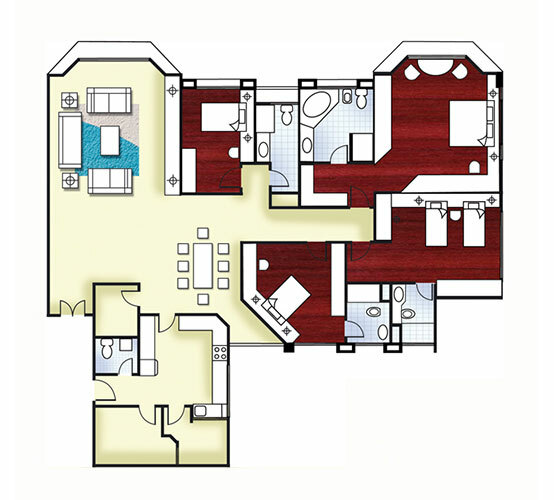 Stylish, contemporary and very spacious, our Type A unit has 2,427sq.ft (226sq.m) of living space which offers 3 large bedrooms and extra spacious master bedroom, each with its own private bathroom. Rates quoted are nett inclusive of service charge and maintenance fees. Rates quoted exclude utility charges such as electricity, water consumption and telephone/internet subscription. Utility is charged based on the actual consumption. Rate quoted exclude any consumable items. Available fully/partly furnished or unfurnished. Minimum leasing period is 1 year. 1 month rental (non-refundable) at the time of booking. Balance payable before tenancy commencement date. Kindly contact us for our bank accounts information for international remittance. Kindly contact us for tenancy terms & condition for long-term tenancy of 1 year & above. 3 months security deposit and RM2,000 utility deposit. Deposit paid is refundable upon termination of tenancy less any liabilities. During our Condominium Management Office hours. Copyright© 2019 Saujana Villa. All Rights Reserved.